Definition at line 18 of file CRERulePanel.h. Definition at line 10 of file CRERulePanel.cpp. References myInclude, myMatches, myMessages, myPost, myPre, myReplies, myRule, onIncludeModified(), onMatchModified(), onMessageModified(), onPostModified(), onPreModified(), onRepliesModified(), MessageManager::postConditions(), MessageManager::preConditions(), and quests. Definition at line 48 of file CRERulePanel.cpp. Referenced by onIncludeModified(), onMatchModified(), onMessageModified(), onPostModified(), onPreModified(), and onRepliesModified(). Definition at line 113 of file CRERulePanel.cpp. References currentRuleModified(), myInclude, myRule, and MessageRule::setInclude(). Definition at line 73 of file CRERulePanel.cpp. References currentRuleModified(), myMatches, myRule, and MessageRule::setMatch(). Definition at line 89 of file CRERulePanel.cpp. References currentRuleModified(), CREStringListPanel::getData(), myMessages, myRule, and MessageRule::setMessages(). Definition at line 97 of file CRERulePanel.cpp. References currentRuleModified(), CREPrePostPanel::getData(), myPost, myRule, and MessageRule::setPostconditions(). Definition at line 81 of file CRERulePanel.cpp. References currentRuleModified(), CREPrePostPanel::getData(), myPre, myRule, and MessageRule::setPreconditions(). Definition at line 105 of file CRERulePanel.cpp. References currentRuleModified(), CREReplyPanel::getData(), myReplies, myRule, and MessageRule::setReplies(). Definition at line 52 of file CRERulePanel.cpp. 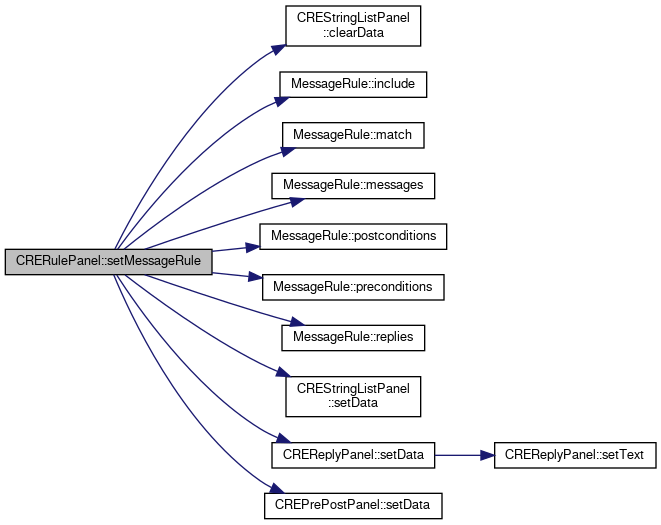 References CREStringListPanel::clearData(), MessageRule::include(), MessageRule::match(), MessageRule::messages(), myInclude, myMatches, myMessages, myPost, myPre, myReplies, myRule, MessageRule::postconditions(), MessageRule::preconditions(), MessageRule::replies(), CREStringListPanel::setData(), CREReplyPanel::setData(), and CREPrePostPanel::setData(). Referenced by CREMessagePanel::currentItemChanged(), and CREMessagePanel::setItem(). Definition at line 38 of file CRERulePanel.h. Referenced by CRERulePanel(), onIncludeModified(), and setMessageRule(). Definition at line 33 of file CRERulePanel.h. Referenced by CRERulePanel(), onMatchModified(), and setMessageRule(). Definition at line 35 of file CRERulePanel.h. Referenced by CRERulePanel(), onMessageModified(), and setMessageRule(). Definition at line 36 of file CRERulePanel.h. Referenced by CRERulePanel(), onPostModified(), and setMessageRule(). Definition at line 34 of file CRERulePanel.h. 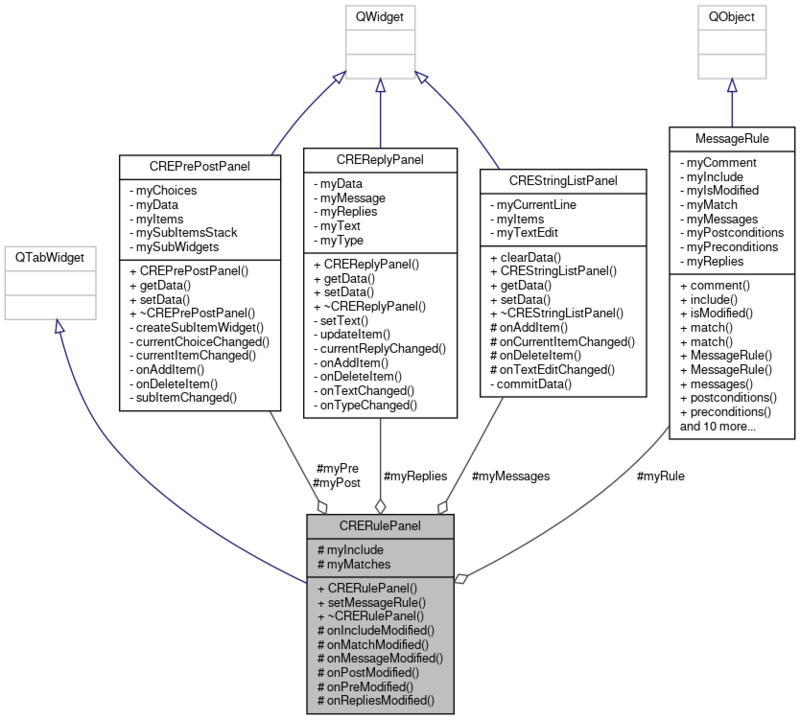 Referenced by CRERulePanel(), onPreModified(), and setMessageRule(). Definition at line 37 of file CRERulePanel.h. Referenced by CRERulePanel(), onRepliesModified(), and setMessageRule(). Definition at line 32 of file CRERulePanel.h. Referenced by CRERulePanel(), onIncludeModified(), onMatchModified(), onMessageModified(), onPostModified(), onPreModified(), onRepliesModified(), and setMessageRule().